Wonderful collage of your blooms. Happy Spring! these are very beautiful and being personal makes them even better…. 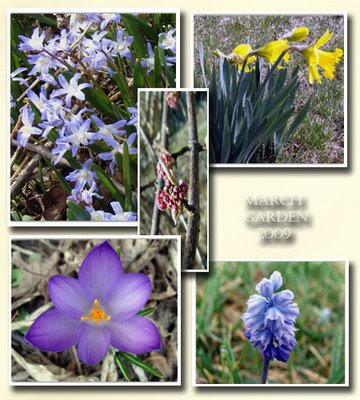 Purples, blues and yellows make my spring! So beautiful together. Still working on getting the pics clearer, but at least learning how to make a composite. Nice collage. This is the problem I find with blogging. Suddenly I get into photography. Next thing, I want to spend unfeasibly large sums of money on a camera. Now the banks are tight with credit i’m unable to get one on the never, never. Keep experimenting! You are doing great and I really enjoy the results.